Claude Lelouch of "A Man and A Woman" fame, now presents a visual masterpiece of love, music and life . . .
Wow. I had seen a pared-down version of this amazing film when it was called BOLERO a decade or two back. Now that I have seen the uncut film, I'm in awe. 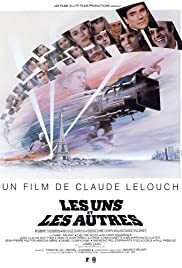 As I grow older I seem to appreciate Claude Lelouch more and more. This one may be his masterpiece. Weaving together three generations and four families (German, French, American and Russian), the writer/director manages to run the gamut from wildly romantic to elegantly subdued (note the distanced reconciliation scene between mother and son late in the film) offering up whatever is called for at a given moment. Music is paramount to this movie--it is ever-present and holds the diverse threads together. The cast is amazing, too. What a coup. This is the kind of film I'll recommend to everyone, and now that it is out on DVD, movie lovers are all the luckier for it.